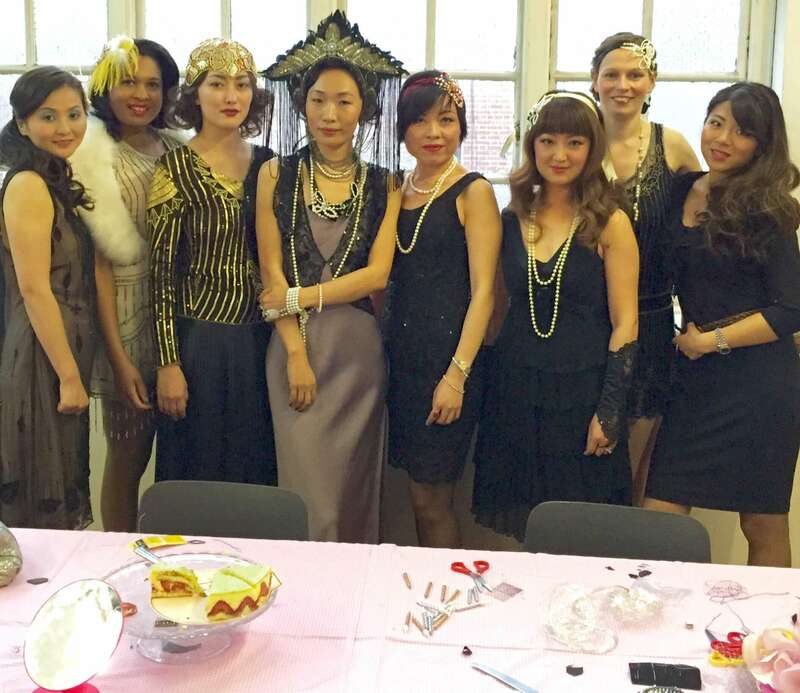 Glam Hatter Gatsby Hens Hit The Candlelight Club. 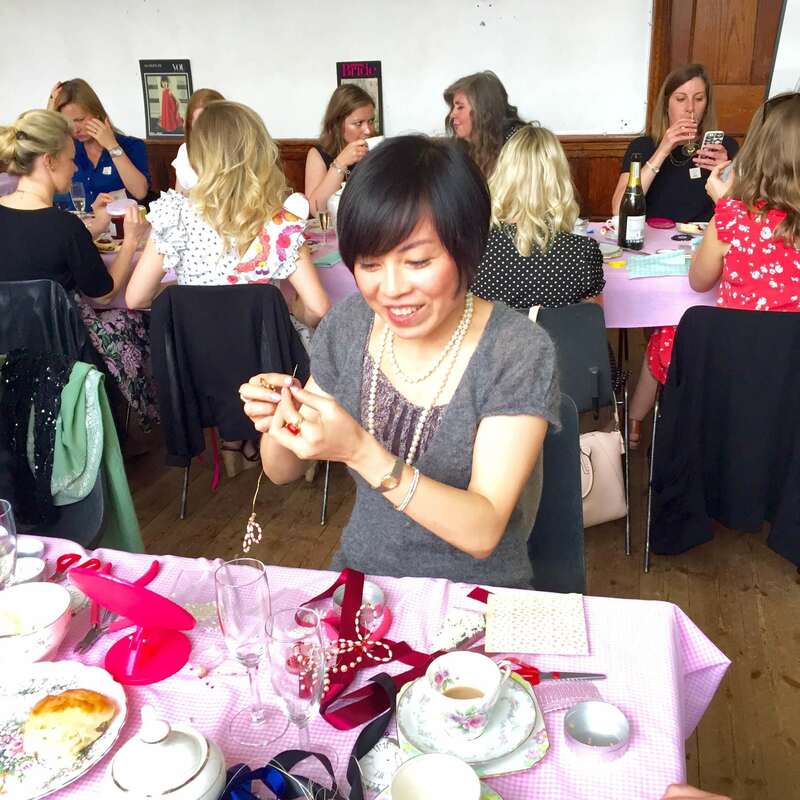 Last week we hosted a Gatsby Inspired Accessory Making Workshop for Emily and seven of her friends at our Exmouth Market venue in London. The girls spent a lovely 3 hours with us enjoying vintage afternoon tea and producing very on trend 1920’s Gatsby-inspired necklaces and headpieces to complement their outfits to wear to The Candle Light Club’s Summer Ball. As well as Emily’s hen party it just so happened to be her Birthday. Jing had secretly brought along a gorgeous cake made by Paul’s Bakery to celebrate the occassion. 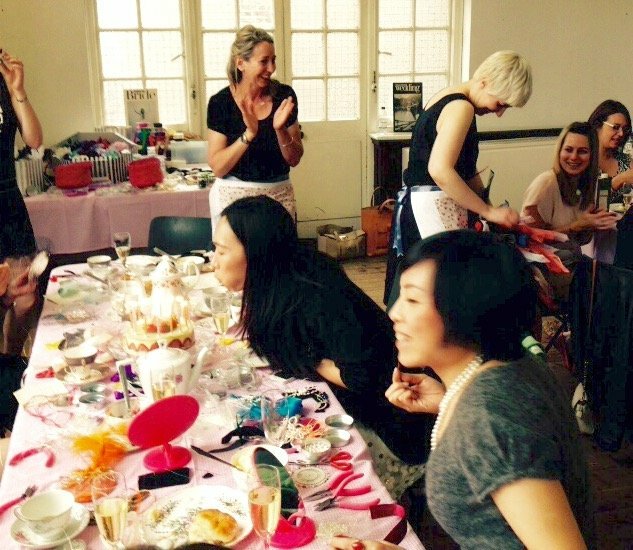 Our Glam Hatter Girls plated it up on our vintage china cake stand, added candles and served it at the table. It was a very emotional moment when her friends started to sing “Happy Birthday” as the other hen party in the room joined in with their amazing operatic voices. I was really quite moved! 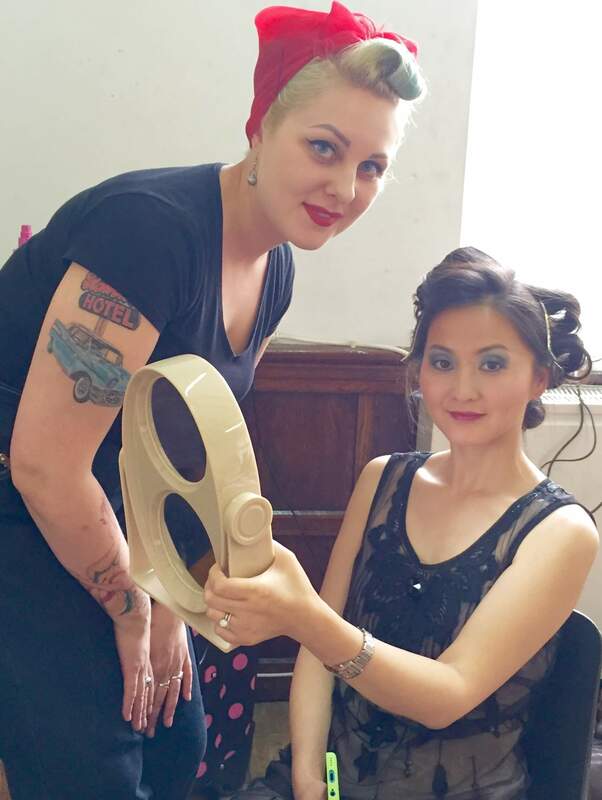 During the workshop the girls received full vintage hair and make-up to make them look fabulous for the Candle Light Club. It did give the experience a beauty parlour feel as the girls carried on creating their works of art as their hair set in hairclips and rollers! This is Alex she’s responsible for making the girls look amazing. They ordered full hair and make-up to run alongside the headpiece making workshop. If you would like this service please email us at Glam Hatters for all the info. 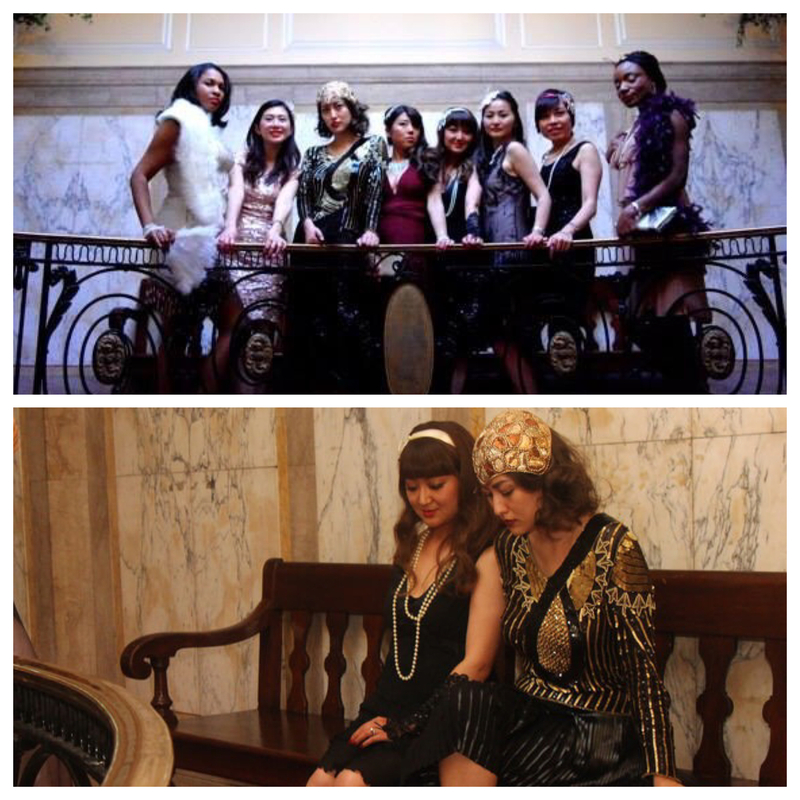 The girls had the choice of making Gatsby inspired headpieces, necklaces or fascinators during their workshop. The hen below made a gorgeous pearl headpiece attached with silk ribbons. Emily made a pearl necklace stitched to a felt collar attached by silk ribbons. The girls who made necklaces brought headpieces with them and matched the necklaces to the hats using our extensive range of crystals, beads and sequins. Lots of hens match their necklaces to the hats they wear to the wedding or match their fascinators and headpieces to their wedding outfits. Giving hens the added bonus of not having to trawl the high street for matching wedding hats! Make your own fascinator and you can match colours exactly. 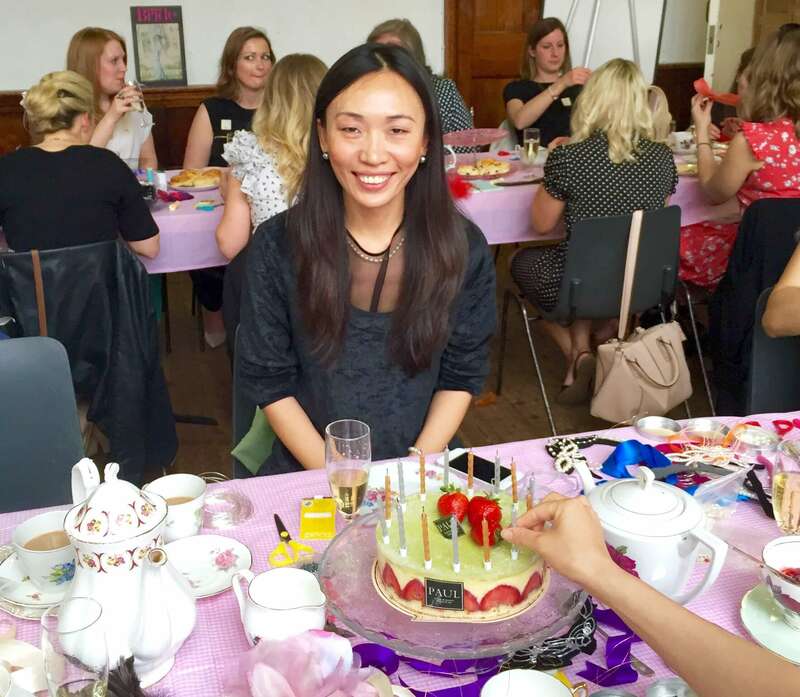 Emily’s group brought bubbly with them and ordered a Glam Hatters’ mini cream tea which they were served on vintage china during the half time break and it kept them going till dinner. 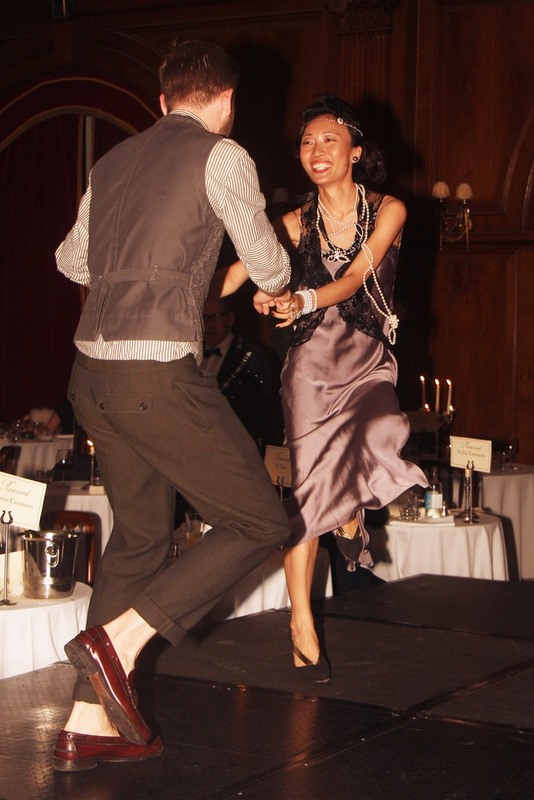 They then headed from our venue in Exmouth Market straight to The Candle Light Club for dinner and dancing. Emily made the front page of The Candle Light Club’s Summer Ball pictures with their fabulous accessories and gorgeous outfits. Glam Hatters highly recommend The Candle Light Club, it’s super stylish, incredibly extravagant and as you can see in the picture of Emily below it’s a lot of fun. 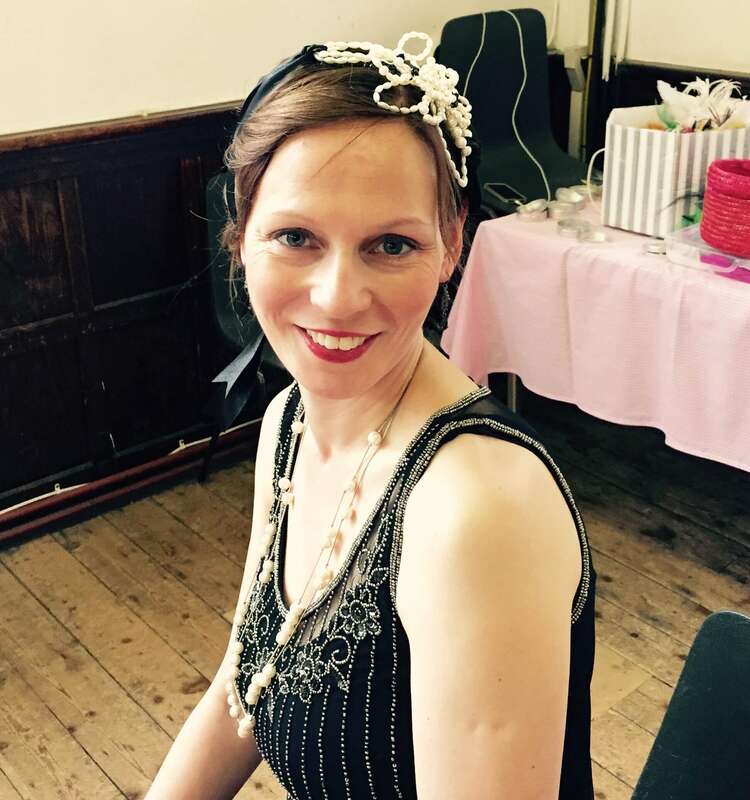 If you would like check out The Candle Light Club and need fabulous accessories to adorn yourself with but don’t have a hen party coming up why not join our Glam hatters’ workshop on the 19th of July? 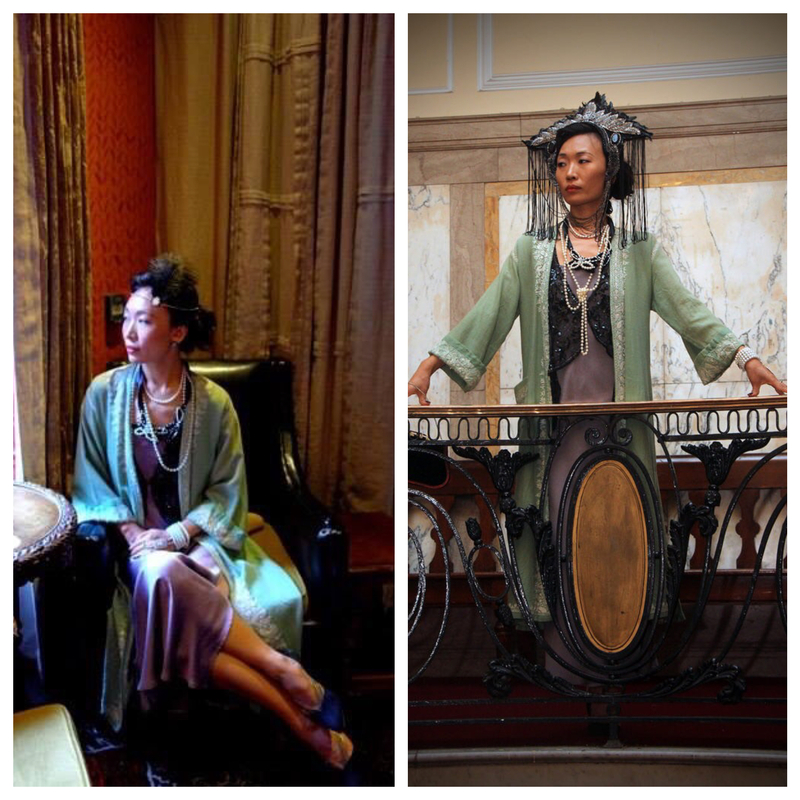 You will enjoy a 3 hour Gatsby workshop with full afternoon tea. Quote “blogtastic” on your email and we will charge you £49 pp instead of £73. 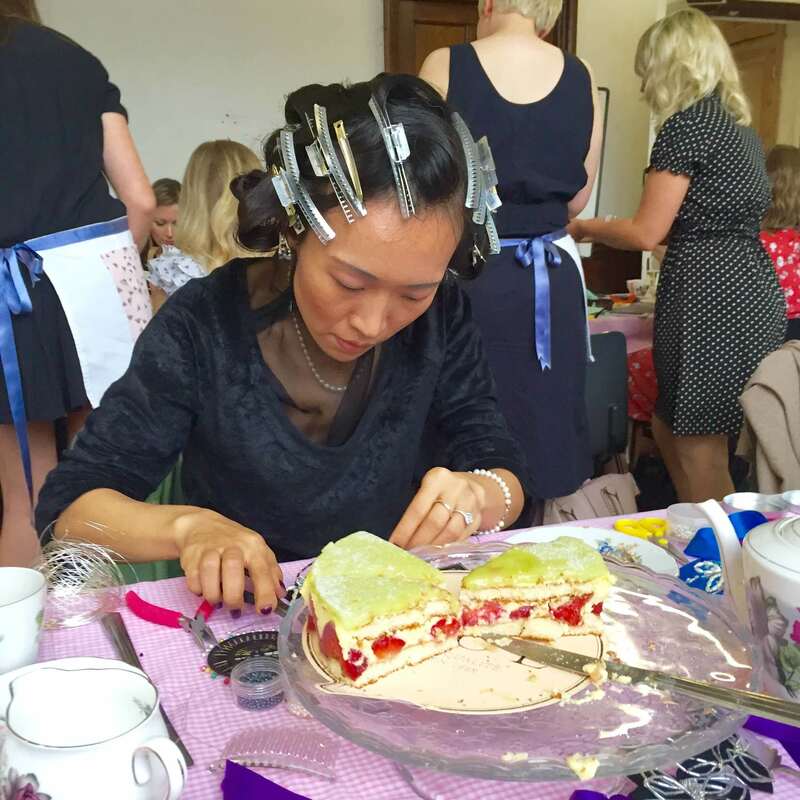 Make a fabulous headpiece, meet new friends and enjoy afternoon tea – sounds like the prefect Sunday to me! For our 19th July workshop click here. For all our fabulous packages click here. For The Candle Light Club click here. For hair and make-up packages to run along side your workshop please email us and we will give you all the details.